The gold canopy outside my window has disappeared. For two weeks light, filtered and gilded by maple leaves, shed luster on the yellow carpet beneath. The luminous scene drew me into in a warm cocoon of whispering leaves. I listened to their stories of summer, their losses and gains, and their sweet good-byes. Now stark branches make black scribbles on the wan blue sky. The dove perching with her head under her wing seems so exposed. 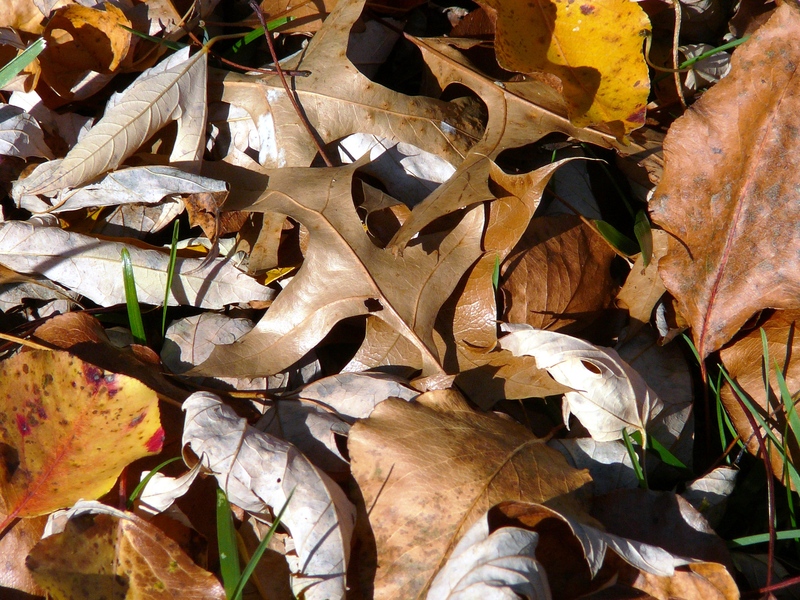 The leaves on the ground curl like an old person’s hand, mottled and transparent. 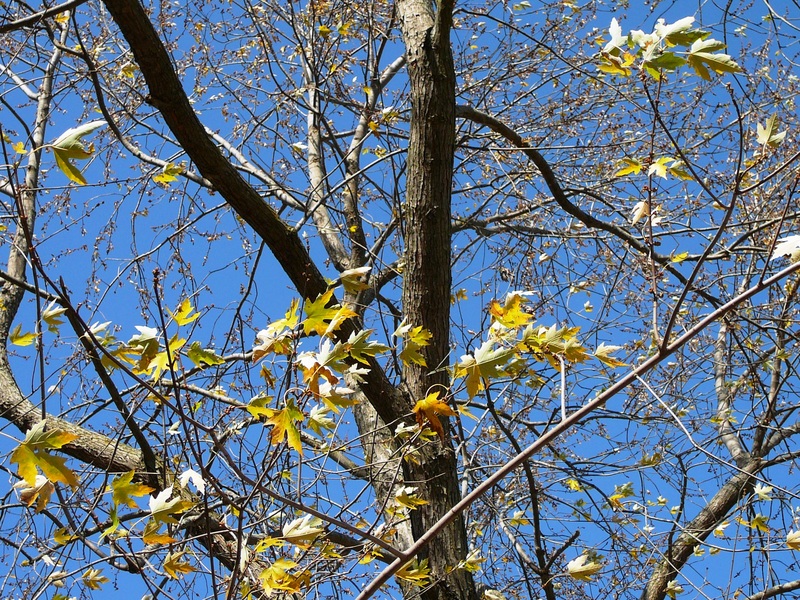 Only a few leaves remain on the branches, twisting in the wind, straining against their stems. The season of letting go, of loosening one’s fastenings and sailing out into the unknown, comes round again. Too soon. A November nostalgia settles over me, that curious longing for lost opportunities and for what was, which, in retrospect, reveals those things, which were more important than you ever realized at the time. November – a time to disrobe, to remove what is no longer serviceable and send energy into the depths, the root of things. Someone did something that really hurt my feelings. I have carried the wound for a week or two. It still smarts and brings tears when I take it out and look at it. I believe God is telling me to let it go, to have compassion for this person and her suffering. I don’t want to though. I wonder if there is something I need to listen to and learn from in the intensity of the pain. It is one of those situations where there is really little I can do, but move on with generosity and amnesia, until forgiveness moves in. So, let’s turn back to the leaves. 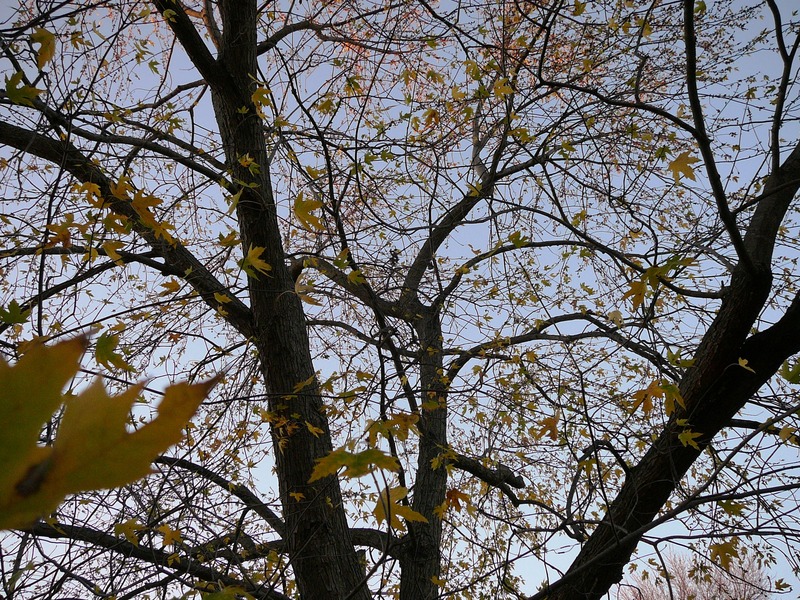 The word used to describe the process of a tree shedding its foliage is senescence – getting old. The eleventh month impresses upon us the reality of aging, of time running out, as the year winds down. As the days shorten, the green chlorophyll is destroyed and oranges and reds in the leaves are revealed. The tree is preparing for winter dormancy and draws all the nutrients in the leaves through the stems and down into the roots. The sugars and amino acids that are produced, instead of the chlorophyll dependent upon the sunlight, serve as a kind of antifreeze for the tree. At the place where a leaf stem fastens to a branch, there are two kinds of cells. The part of the stem attached to the branch contains waxy impermeable cells. These are called the bundle scar and contain the bud of next year’s leaf. The cells connected to the leaf itself are softer and snap easily in the wind and rain. 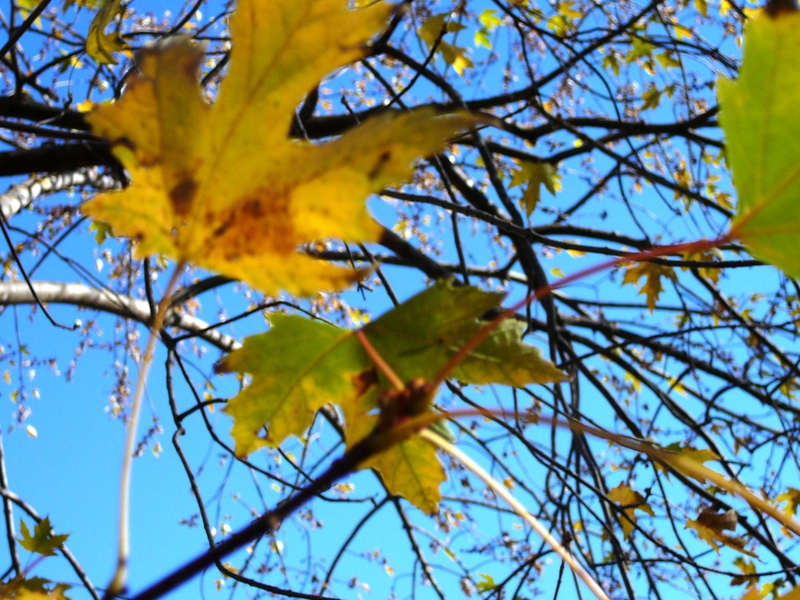 I watch a lone leaf near the top of my neighbor’s tree. It flutters, twists, turns in the wind, then releases itself and drops floating down through the huge dark limbs, finally settling lightly on the earth below like a sigh. Oh to be drawn so gracefully by the tug of gravity into the arms of God’s providence. How glorious to ride the wind, to be tossed and blown. I think I should like to die in autumn or early winter, dropping like a late hanging leaf from a very tall tree. I am grateful to the leaves this year and their lesson to let go, to surrender, to fall, and come to rest at the foot of the tree of life. I am grateful, too, for bundle scars, that place that heals the wound of separation with the promise of new growth. This entry was posted in Contemplation, prayer, faith, spirituality and tagged letting go, nostalgia, November, surrender, trust. Bookmark the permalink. generosity and amnesia until forgiveness sets in. what a perfect description of the fall in my life these days. i love your writing. your words speak to my soul. this feels like my fallow season. thank you so much for seeing God in the leaves, boots, art, and whiskey breath men with their four legged God as their companion. you are not weird you are a “foolish” (to the linear folk in our midst) contemplative who sees God. so glad to have your eyes on my life. thank you for your living conscious prayer.